Aimée Lind Adamiak knows the rules of Svalbard very well. She has lived for six years in Longyearbyen, the island’s Norwegian-controlled settlement of 2,500 people. She knows that as soon as she leaves the capital, she has to shoulder a loaded Mauser rifle: “On Svalbard there are more polar bears than humans, so we need to be ready to protect ourselves if necessary,” she said. Svalbard is an international archipelago made up of dozens of islands halfway between northern Norway and the North Pole. In 1920, the League of Nations approved the Svalbard Treaty, which granted Norway sovereignty over the various islands and a total area of 61,000 square kilometers. The treaty allowed all the signatories the same rights of access to this land far beyond the Arctic Circle. Since then, several countries, including Sweden, Poland, and the Soviet Union (and more recently the Russian Federation), have established settlements on Svalbard for economic and strategic reasons. But only Norway has been able to develop its coal mining settlements into full-fledged modern villages and towns, with Longyearbyen serving as the capital of the central island, Advent Fjord. In fact, Svalbard is one of the very few territories across the globe where basically anyone is welcome to settle down. The Svalbard Treaty’s guarantees of open access supersede any and all limitations set by the laws of other countries, be they Norwegian statutes or E.U. rules. There are still two former Soviet settlements on Svalbard, Barentsburg and Pyramiden, which are ruled by local Russian administrators. Barentsburg, a village of about 500 miners and their families from Ukraine and Russia, is still inhabited. But Pyramiden was abandoned in 1998. Two years earlier, a tragic air crash at Operafjellet mountain range killed 130 people from the Russian communities. The decision to abandon the village was made on very short notice, and everything was left behind. Due to the frigid Arctic climate, which acts as a preservative, the whole infrastructure of this former Soviet model village remains intact—and the well-built housing will likely be standing for another 500 years. Visitors encounter a fully equipped ghost town literally at the end of the world. Just a few Russian guards still live there to welcome day visitors from Longyearbyen, which is 50 kilometers and a four-hour boat trip away. Longyearbyen offers a very different kind of experience. It hosts the planet’s most northerly university, University Centre in Svalbard (UNIS), cultural institutions like Gallery Svalbard, and the Svalbard Global Seed Vault (which houses “spare copies” of seeds held in gene banks worldwide). These institutions attract researchers, students, and their families from all over the world. Several budget airlines connect Svalbard with destinations across Europe and bring tens of thousands of tourists here every year. Most recently, the fact that the archipelago is a tax-free zone with cheap alcohol has helped make freezing Longyearbyen a most unlikely party destination. For most of the last century, Longyearbyen was run by the CEOs of Store Norske, the state-owned coal mining company. 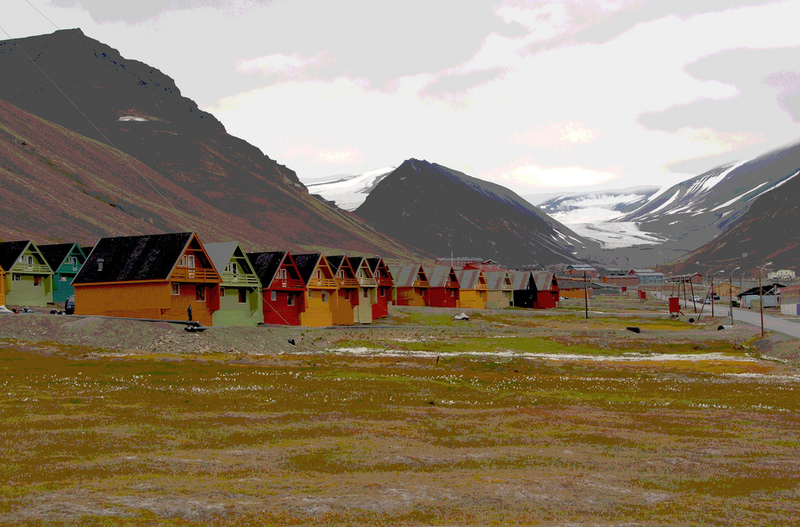 In 2002, the people of Longyearbyen participated in their first free election. Since then, the community has been working step-by-step to develop a polity that resembles a Norwegian municipality. Since most people stay in Svalbard for only a limited time for work and there are few services for elderly people, Longyearbyen and Svalbard remain places for the young, healthy, and entrepreneurial. But the outer world is never far away—as I learned when Aimée Lind Adamiak told me a story about her neighbor. In summer 2011, Christin Kristoffersen almost lost her two sons in the attacks carried out by Norwegian terrorist Anders Behring Breivik that killed 77 people in Oslo and Utöya. Christin’s sons were taking part in the youth summer camp of the Norwegian Labor Party. Both were injured but survived. Two months after these attacks, which are commemorated by a local monument, Christin was elected the first female mayor of Longyearbyen. Bruno Kaufmann, a journalist and election commissioner in Falun, Sweden, is founder of People2Power, a publication on democracy that debuts today and in which a version of this piece is being co-published. *Photo courtesy of Gus MacLeod.